Thanksgiving is in the books and you’re feeling more anxious than ever. Visiting with our loved ones during the holiday season can shine a light on issues you haven’t seen before or have been avoiding. We recommended taking a “5 Sense Approach” towards caregiving over the holidays. Using your 5 senses, you can gain great insight into your loved one’s daily life and the struggles they might be having but are afraid to share with you. This can include mobility issues, cognitive decline, financial difficulty and more. Now what do you do with this information? Our Aging Life Care managers can help you and your family make the most informed decisions for your loved one. 1.) My mother refuses to leave the house and I’m worried about isolation, depression and her overall safety. As Aging Life Care managers, we always recommend communication first. Try to get to the root of the issue with your mother. You can do this on your own, with your family members or with the help of a care manager to act as a qualified mediator. Depending on the outcome, a qualified senior care agency with Certified Aging Life Care professionals, like Complete Care Strategies, can suggest ways to improve your mother’s quality of life while remaining at home. This could involve communicating and coordinating care with primary care physicians on health concerns, hiring a home care aide, arranging for food delivery or transportation or suggesting a senior daycare facility for more social interaction. Clients can take advantage of the vast referral network of resources that established senior care agencies have built over the years. 2.) My parents’ house is a mess and it’s becoming a safety issue. It can be hard to let go of a lifetime of belongings and even more difficult to organize it, keep it tidy as you age. Aging Life Care managers can help you find suitable resources to help your parents with their home. Whether it’s a regular housekeeper, a professional organizer to help them declutter and organize or a junk removal option, a reputable senior care agency can recommend qualified professionals with great credentials. 3.) My dad is not getting around very well and I am concerned about him falling, especially when he’s alone. An Aging Life Care manager can assess the safety of your father’s home and offer safety measures to insure that he can safely navigate his home, on his own. Beyond that, personal emergency response systems and home care aides can be employed. Through years of experience, the best resources are readily available to care managers…saving family caregivers time and stress researching options on their own. 4.) My grandmother kept calling me by my mother’s name and she seemed confused and frustrated at times. Memory loss, forgetfulness is a common concern as loved ones age. But can you distinguish between memory loss attributed to typical aging vs cognitive decline related to dementia? Aging Life Care managers can assist as patient advocates communicating with health care professionals, primary care physicians and specialists on behalf of your family. Additionally, care managers can provide insight on how life might change for your grandmother and what challenges she might face moving forward. 5.) I feel overwhelmed with caring for my parents during the holidays and my siblings don’t offer much help. The holidays can be an opportune time to re-evaluate your family members’ needs, both as caregivers and those aging family members receiving care. Open lines of communication to voice concerns, struggles as well as successes. Aging Life Care managers can act as impartial adviser, a mediator to insure a productive discussion, where your parents’ best interests are addressed. Regardless of the time of year, every caregiver needs a break. Hiring a home care aide or companion to take a shift or two or even a recommendation for a senior daycare facility can be coordinated by a care manager. An Aging Life Care manager can take a look at your parents needs and offer recommendations on what can be outsourced to ease the burden on family caregivers, friends who provide support. Being together as a family can bring to light the issues your aging loved one might be facing. The realizations can be stressful but you are not alone. Our Aging Life Care managers are experts in senior care. We will listen, evaluate and make swift, educated recommendations on how best to move forward with a focus on quality of life and safety for your family member or loved one. Beverly Bernstein Joie is the founder and president of Complete Care Strategies, a senior care management company serving Philadelphia and its surrounding communities. A Certified Aging Life Care Manager with more than 20 years of experience, Beverly has worked in senior care since 1994, both in assisted living communities and in private practice. She is a member of the Aging Life Care Association and was a former president of the Philadelphia Chapter. 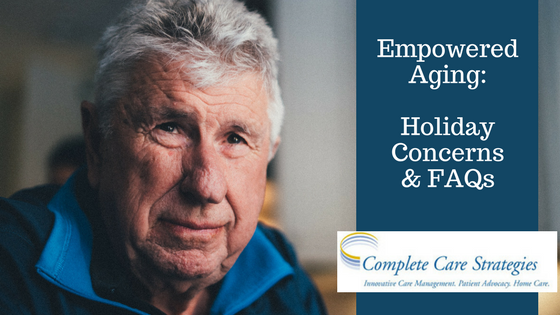 Complete Care Strategies consists of care managers, specialized human service professionals, who advocate and direct the care of seniors and others facing ongoing health challenges. Working with families, its expertise provides the answers at a time of uncertainty. Along with its licensed home care division, it can help clients safely remain at home under the watchful eye of skilled professionals. Families are afforded an integrated model of care that with guidance and advocacy, lead them to the actions and decisions that ensure quality care and an optimal life for those they love.